Tony Blair is under pressure to ban from Britain a controversial Muslim cleric due to speak at several events. 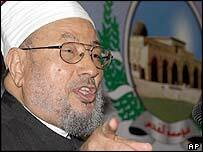 Egyptian-born Sheikh Yusuf Al-Qaradawi has been accused of making anti-Semitic remarks and supporting suicide bombers. Tory leader Michael Howard demanded to know why the cleric had not been refused entry to the UK, but Mr Blair said any exclusion must be lawful. In an exclusive interview for BBC 2's Newsnight, Dr Al-Qarawadi claimed Islam justified suicide bombings. However, the Muslim Council of Britain, which has accused sections of the media of conducting a "character assassination" campaign against Dr Al-Qaradawi, said its view was that suicide attacks were not allowed by Islam. During Prime Minister's Questions, Mr Howard asked whether Mr Blair agreed that someone who "backs child suicide bombings and is banned from the US because of his alleged terrorist links" should be allowed into the country. Mr Blair said Home Secretary David Blunkett had "already indicated we will keep this under very strict review", but said there were rules that had to be applied. "We have to be sure that if someone is excluded from this country, they are excluded in a way that is lawful." In the interview with Newsnight, Mr Al-Qaradawi claims suicide bombings were "martyrdom in the name of God". He said: "It is allowed to jeopardise your soul and cross the path of the enemy and be killed, if this act of jeopardy affects the enemy, even if it only generates fear in their hearts, shaking their morale, making them fear Muslims. "If it does not affect the enemy then it is not allowed." On the killing of women and children in Israel, he says: "Israeli women are not like women in our society because Israeli women are militarised." He says Allah has "given the weak what the strong do not possess and that is the ability to turn their bodies into bombs like the Palestinians do". Mr Al-Qaradawi was guest speaker at the European Council of Fatwa and Research in London's City Hall, hosted by Mayor of London, Ken Livingstone. He told the audience Palestinian suicide bombings were the last resort for an oppressed people. He said "martyrdom operations" are weapons to which the weak resort and that if the Palestinians had access to tanks they would use them instead. But he expressed surprise at the fact that his visit had caused controversy. "It is not the first time I have visited London, it is not the 10th time or the 100th time. "For over a third of a century I have been visiting London. "London is an open city, so why is there this row when I visit London today?" he asked. Iqbal Sacranie, secretary general of the Muslim Council of Britain, said his organisation could not comment on the interpretation of Islam by Muslims around the world. However, he added: "Our view is very clear. We are guided by Islamic scholars and it is very clear that British Muslims are not allowed to carry out suicide bombings." Mufti Barkatullah, from the Islamic Cultural Centre in north London and a respected thinker among British Muslims, said Islam was very clear in its denunciation of killing innocent people. "Any act of violence which makes innocent people a victim is not allowed. This position has always been - and it always will be," he said. The Commons row came just hours after Home Office minister Fiona Mactaggart withdrew her support of a Muslim women's conference next week because Mr Al-Qaradawi is guest of honour. But the Muslim Association of Britain, which is hosting Dr Al-Qaradawi, regards him as a moderating voice. Inayat Bunglawala, a spokesman for the Muslim Council of Britain, echoed this view. He said: "Dr Al-Qaradawi is deeply respected by millions of Muslims around the world. "He has been a consistent opponent of the extremism espoused by al-Qaeda and similar groups, and has regularly denounced the killing of innocent people in the 11 September attacks." The Muslim Association of Britain website said Dr Al-Qaradawi would be in London for a week-long visit during which he would take part in a number of functions. He is expected to preach at the Regents Park mosque in north London. Dr Al-Qaradawi has been banned from the US since 1999. The row came as the Home Secretary David Blunkett said he wanted to make inciting religious hatred, including against Muslims, a criminal offence as soon as possible. He said it was needed to stop people being abused or targeted purely because of their faith. "His presence [in the UK] has stirred a political storm"
Is Islamophobia affecting the UK?